Your toilet gets a lot of use. In fact, it is one of the most frequently used fixtures in your entire home. 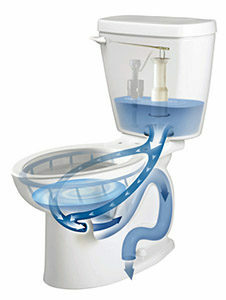 Unfortunately, most homeowners don’t give their toilets much thought until a problem arises. At Lightfoot Mechanical, we offer toilet installation and repair in Fort Worth, TX to help you make sure the toilets in your home work like they are supposed to. Whether you need to have an existing toilet replaced, you are remodeling your home to add an additional bathroom, or you need to have toilets installed in a brand new home, you need an expert plumber who knows how to do the job correctly. When improperly installed, toilets often leak and fail to work like they should. At Lightfoot Mechanical, we can help you choose the perfect toilets for your home and professionally install them at a time that is convenient for you. With our expert installation services, you will never have to worry about whether the job was performed correctly. Most residential toilets are fairly simple in nature, but the problems can be anything but. While some are easy to fix, many others are more complex and require a plumbing expert. Whether it is a minor problem like a slight leak or clog or something more serious, it is important to contact a plumber in Fort Worth right away. While seemingly insignificant, many minor problems indicate a more serious underlying issue that needs to be addressed immediately. That’s why it is best to contact an expert at the first sign of trouble. At Lightfoot Mechanical, we are proud to offer dependable toilet installation and repair in Fort Worth, TX and the surrounding areas. Whether you need help with a simple project or something a bit more complex, our expert plumbers do it all! We even have technicians on call 24 hours a day, 7 days a week for emergency service. To schedule an appointment, please call 817-596-0309 now.